Adaptation, as an internal human process, is an often-overlooked construct in occupational therapy education, research, and practice. Adaptation Through Occupation: Multidimensional Perspectives aims to change that by presenting different perspectives that challenge the reader’s understanding of occupational adaptation. As the-first-of its-kind text to explore, analyze, and present a comprehensive and multidimensional approach to understanding occupational adaptation, the collection of writings in this text add to the range of knowledge available in occupational therapy. Adaptation Through Occupation: Multidimensional Perspectives by Drs. Lenin Grajo and Angela Boisselle provides in-depth perspectives of occupation and adaptation that can be used to teach courses on foundational and theoretical perspectives in occupational therapy and occupational science undergraduate and graduate programs, and as a critical module in teaching neuroscience to occupational therapy students. This text also aims to facilitate new bodies of research to define and apply the concept of adaptation in relation to occupational performance and participation. 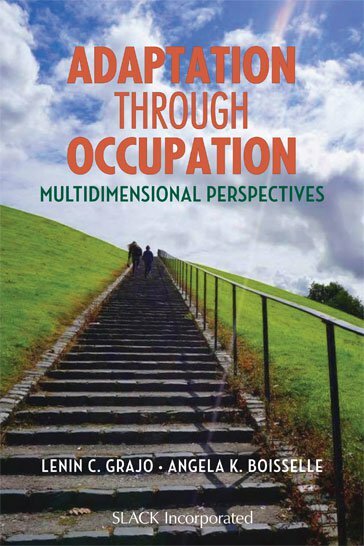 Adaptation Through Occupation: Multidimensional Perspectives opens the gates for new ways of understanding occupational adaptation and adds necessary information to the existing knowledge in the occupational therapy profession. Lenin C. Grajo, PhD, EdM, OTR/L, is Assistant Professor of Rehabilitation and Regenerative Medicine (Occupational Therapy) in the Programs in Occupational Therapy at Columbia University Irving Medical Center in New York, NY. A pediatric occupational therapist by practice, he is a strong advocate of evidence-informed, occupation-based, theory-guided, client-centered, and occupational justice–promoting occupational therapy service provision. Dr. Grajo is elected Chairperson of the Education Special Interest Section of the American Occupational Therapy Association (AOTA) and a voting member of the Commission on Education of AOTA from 2016-2019. He is a multi-awarded educator who has taught in the Philippines and the United States. Angela K. Boisselle, PhD, OTR, ATP, has 18 years’ experience as a pediatric occupational therapist and assistive technologist. She currently works at Cook Children’s Health Plan as the Therapy Supervisor of Utilization Management. Her practice and research background include pediatric complex care, occupational adaptation, neuromuscular diseases, creativity, international occupational therapy, and assistive technology. Dr. Boisselle is active with the American Academy of Cerebral Palsy and Developmental Medicine (AACPDM) and World Health Organization Global Cooperative on Assistive Technology (GATE). Dr. Boisselle has also served as a research consultant with University of Texas at Arlington Computer Science and Engineering Department since 2009. She has collaborated on several projects, including robotics, human computer interaction, and virtual rehabilitation.